When I think of ‘miami vice’, the TV show comes to mind. I know absolutely nothing about the show.. I would guess that it took place in Miami hence the name, but I was only 1 year old while it was still airing on TV. 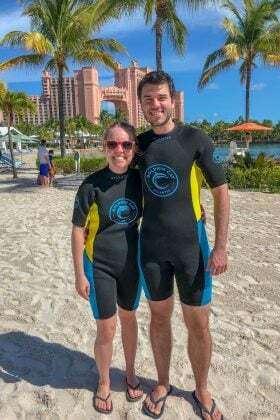 But I guess there’s another thing called a miami vice…which I had to google, haha. 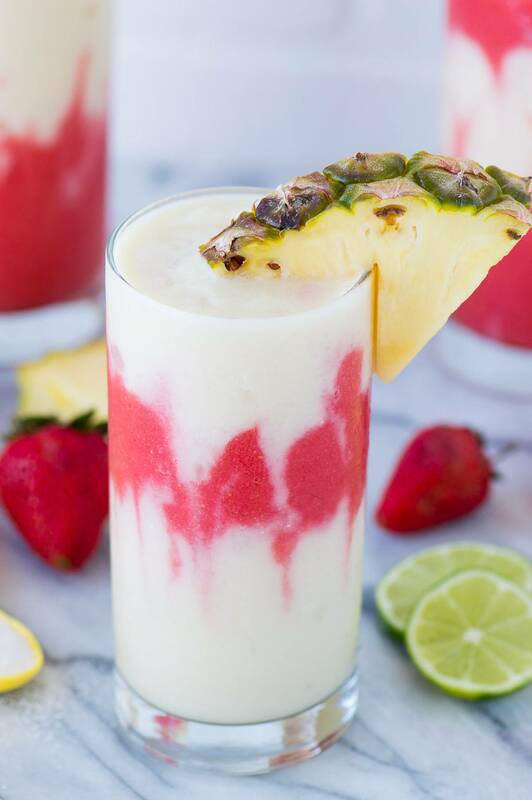 It’s a drink – a strawberry daiquiri and a pina colada layered in one glass! I’ve had both of those drinks before, separately, but I’m all for layered drinks and smoothies. Why have one flavor when you can have two?! We came up with a fun and fruity take on a miami vice mocktail! I love that it’s a mocktail because anyone in the family can enjoy it and who wouldn’t want to take it sip when it looks so fun?! 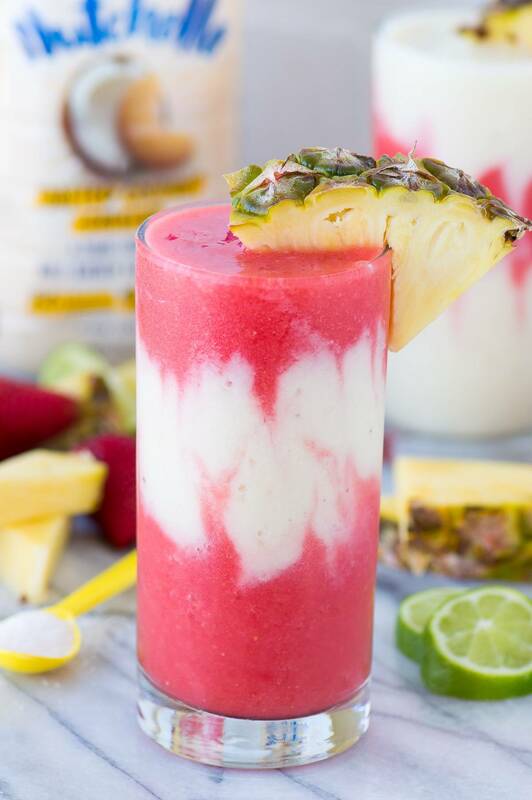 The strawberry daiquiri and pina colada mixes are 5 ingredients each and they come together very quick in a blender. 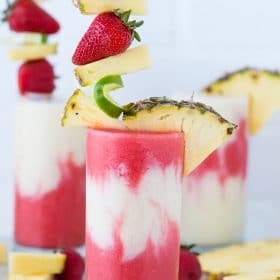 Water, sugar, frozen strawberries, lime juice, and ice for the daiquiri and toasted coconut cashew Nutchello, pineapple juice, a frozen banana, cream of coconut and ice for the pina colada. 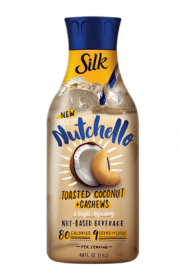 Nutchello is a new line of nut-based beverages from Silk and I’m in love. I’ve even found myself pouring some into a glass and drinking it just like that. Which I NEVER do with milk. 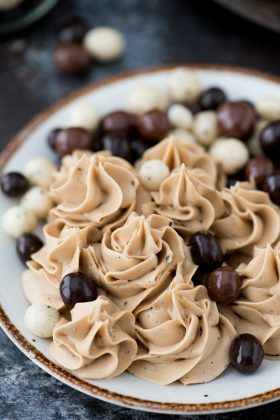 I want to try the dark chocolate walnut version because it sounds like an amazing dairy free chocolate milk substitute. 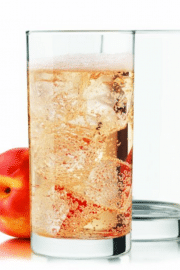 To make the mocktail, blend each mix separately in a blender then layer them in a glass. 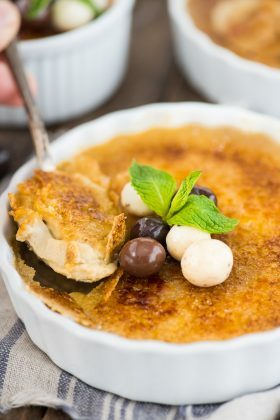 You can get creative in layering them. You could do half and half, daiquiri colada daiquiri, or vice versa. I like to say that the mocktail comes to life when you add the garnishes. Keep it slice with a single slice of pineapple or add drama with a wooden skewer filled with strawberries, pineapple, and lime slices. Add an umbrella toothpick and a fancy straw and we’re practically on a tropical vacation! Visit www.nutchello.com for a .75 cents off coupon! 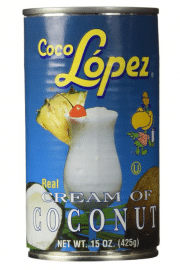 In a blender add the Nutchello, pineapple juice, frozen banana, cream of coconut, and ice cubes. Blend until smooth. 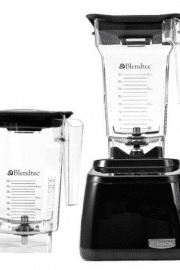 Pour into a separate container and rinse the blender. Yields about 3 cups. 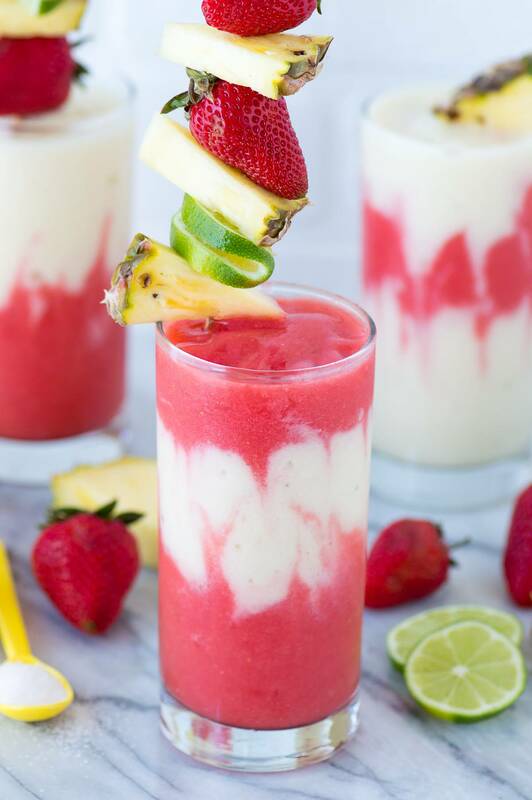 In a blender add the water, sugar, frozen strawberries, lime juice, and ice cubes. Blend until smooth. Yields about 4 cups. 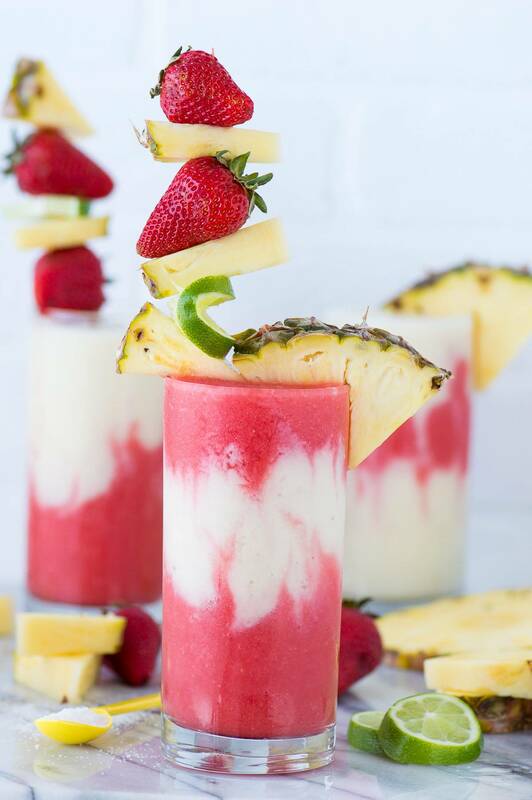 Layer the pina coloda and strawberry daiquiri mix as desired in 4 glasses. 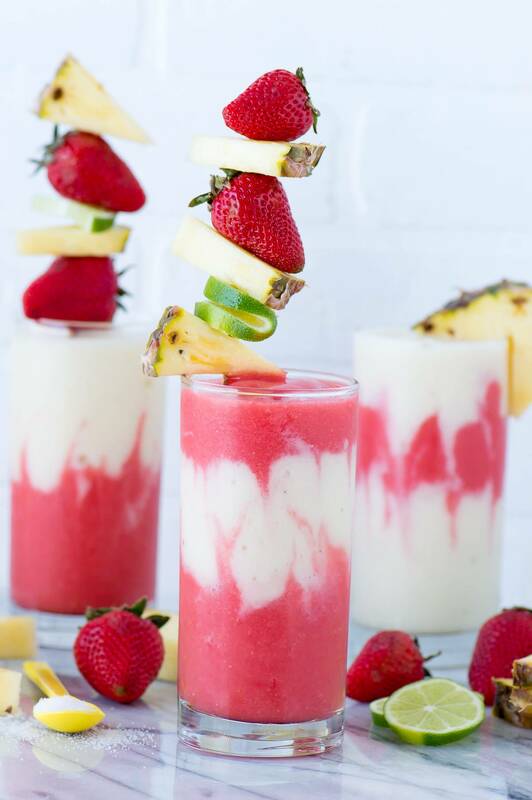 Optional: Top with a fruit skewer filled with pineapple and strawberries or with a pineapple slice. Awwww! I know all about MASH, can I come?! OMG girlfriend, this mocktail is seriously so much fun! It’s almost too pretty to drink! But once you taste it, mmmmm!! I had no idea that there was a cocktail called “Miami Vice”. That’s funny…makes me want to put on pastels and wear loafers without socks. Seriously, though, this is so pretty! I bet it’s delicious too. Haha, new to both of us! This is such a fun idea! I love the layers, and such a pretty color! You make the most gorgeous drinks! This one is totally WOW!! 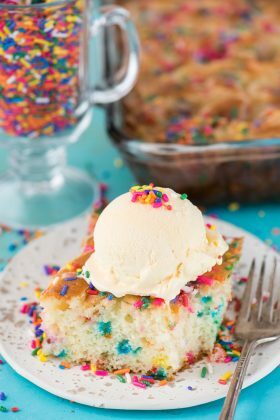 This looks absolutely heavenly! And so delicious! Looks great and perfect way to transport back to a summer vacation! This is just gorgeous!!! Awesome!! Beautiful!! Looooove! Love your smoothies! You are very talented! Thank you!